► Observe the safety guidelines on seat adjustment . ► Make sure that seat 3 is adjusted properly. Electrical seat adjustment When adjusting the seat, make sure that: • you are as far away from the driver's air bag as possible. ► Check whether the head restraint is adjusted properly . When doing so, make sure that you have adjusted the head restraint so that the back of your head is supported at eye level by the center of the head restraint. ► Observe the safety guidelines on steering wheel adjustment . ► Make sure that steering wheel 1 is adjusted properly. 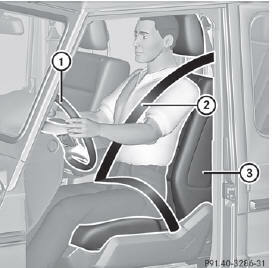 ► Observe the safety guidelines for seat belts . ► Check whether you have fastened seat belt 2 properly . ► Before starting off, adjust the rear-view mirror and the exterior mirrors in such a way that you have a good view of road and traffic conditions . save the seat, steering wheel and exterior mirror settings with the memory function .